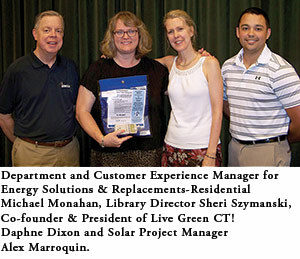 United Illuminated, in partnership with Live Green CT! and the Stratford Library, has donated a pair of kilowatt meter readers to the Library for patron usage. Electricity bills are rising and consumers can cut down on costs and find out what appliances are actually worth keeping. Patrons can simply connect their appliances to the Kill A Watt®, and it will assess how efficient they really are. Large LCD display will count consumption by the Kilowatt-hour, the same as homeowner’s local utility. Consumers can calculate electrical expenses by the day, week, month or year It will also check the quality of power by monitoring voltage, line frequency and power factor. Users will discover whether it is time for a new refrigerator or if that old air conditioner is still saving money. Two of the new devices have been added to the Stratford Library collection and may be borrowed free-of-charge with a current library card. They can be borrowed for seven days and also be renewed. The meter readers are currently on display in the Library’s Main Lobby and come with instruction sheets on use. For further information, call the Stratford Library at 203.385.4164. Tech Fair is Saturday, 6-8 pm! Video Production, Lego Robots and more!